Our Hot Chilli and Tomato Jam is made using a combination of ingredients that provider the diner with a taste explosion to remember! The jam can be used with steak, fish, chicken, chips, cheese, pies and any dish that you fancy cooking. The Hot Chilli and Tomato Jam also doubles as a dip, perfect for crisps, nachos and dipping food / small nibbles. For those who want to get creative, why not mix the jam in with a standard mayo to create an additional tasty flavour. See how our Hot Chilli and Tomato Jam and other products can be used to create meals to remember in our blog. 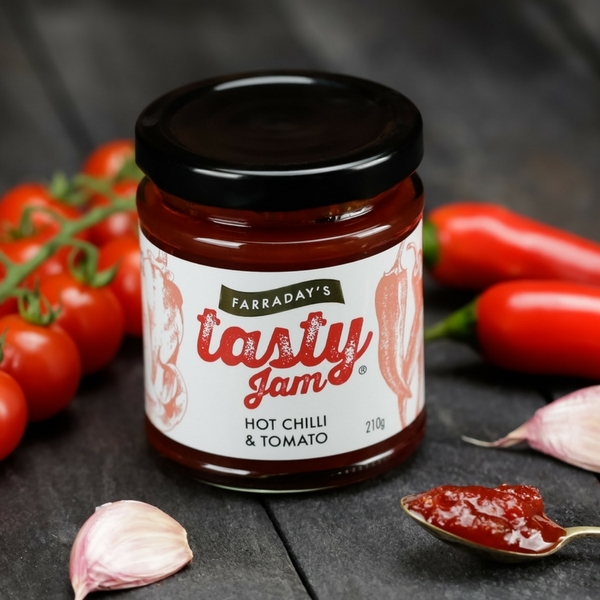 The Hot Chilli and Tomato Jam uses natural ingredients, is free from preservatives, additives and is gluten free – 100% natural! Ingredients – Sugar, Tomatoes (34%), Acetic Acid, Red Pepper, Chillies (9%), Garlic, Ginger, Lemon Juice, Salt & Spices. Nutritional information per 100g – Energy Kcal 116, Energy kj 492, Protein 0.9, Carbohydrate 26.9, Sugars 26.3, Fats 0.1, Saturates 0.0, Fibre 0.8, Salt 0.5.